Open your luxury and neat closet with all season's clothes organized by Anglink durable black velvet hangers, no more clothes on the floor! Dressing up with your favorite clothes easily and start a nice day with exhilaration. Non-slip velvet: Holds slippery or large size clothes in place without falling off, no shedding or fading on your white clothes. Heavy duty and durable: Made of durable PV materials, hold up to 10 pounds clothes, light but sturdy to hang heavy garments like coats, jackets, won't be snapped even bend almost 180 degrees, say goodbye to flimsy hangers that break easily. Accessory & Pant Bar: Accessory bar organize your ties, scarves for perfect outfits, The pant bar grips pants and prevents creases, which makes your pants, slacks organized in the closet. Contoured, Notched Shoulders: Soft velvet leaves no indentations or shoulder bumps, no more crazy shaped shoulders, notches are designed for strappy clothes like tank tops, bras, camisoles. Space Saving: Ultra-thin velvet hangers take much less space, having your closet much neater. 360 degree Swivel Chrome Hook: This is for easy sorting out of clothes that can easily hang on any closet rod even door. For the first time use, it would be better to rinse them under cold water for about 20 seconds to rinse off residue if any and let them dry. STURDY & SUPER DURABLE: Our velvet hangers are made of the most durable new PV materials, won't snap even you bend it almost 180 degrees, reinforced to hold up to 10 pounds clothes, much lighter than wooden suit hangers but sturdy to hold heavy coats without getting bent, organize your all seasons clothes well in closet for easy dressing with exhilaration. SOFT NON-SLIP VELVET: Supreme quality soft velvet prevents slippery or wide neck clothes from slipping off the flocked hangers, no shedding or fading on your white clothes with latest flocking technique. Great coat hangers for suits, shirts, coats, sweaters, skirts, dresses and pants etc. ERGONOMIC DESIGN & ACCESSORY BAR: Contoured shoulder helps keep your clothes in their natural shapes and soft velvet leaves no shoulder bumps or pants creases, precisely-cut notches perfect for hanging straps of tank tops and camisoles. Nice accessory bar organize your favorite ties or scarves for sorting outfits, what's more, it helps the felt hangers stay sturdy and straight. 360 DEGREE SWIVEL CHROME HOOK: For easy sorting of clothes no matter which direction you hang your clothes, strongly attached to the durable PV materials hanger so the hook doesn't detach or snap easily. SPACE SAVING: Ultra thin velvet hangers with length 17.5 x height 9.4 x thickness 0.27 inch take up much less space than bulky plastic and wooden hangers, you can buy more clothes fit them in and show your much neater and luxury closet to your friends! 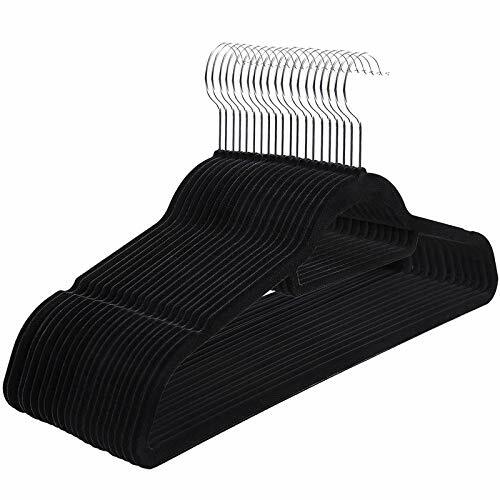 So just replace all your old hangers at once with our delicately packed of 20 black velvet hangers, with 1-year warranty.